Assam Medical College Hospital Recruitment 2018 Online Application for Attendant, Peon, Ward Boy, Cook & Chowkidar jobs under AMCH Dibrugarh Assam. Qualification for all posts: Candidates should be class-VIII passed. Reservation: Reservation of posts for the woman candidate and physically handicapped candidates will be as per prevailing Govt. rules. Age: 18 to 43 years as on 01.01.2018.The upper age limit relaxable by 5 years for SC, STP, STH Candidates only. Application Fee: A Treasury Challan of Rs.250/- only for General Category Candidates and Rs.150/- only for OBC/MOBC, SC, ST(P)& ST(H) paid through Treasury Challan to the Head of Account “0210-M&PH-03-MET&R-105-Allopathy” and the scanned copy of the challan to be uploaded while submitting the online application form. No fee is required for BPL candidate and they are required to upload their BPL certificate from the competent authority for such exemption fee along with the application. Interested candidates shall have to fill up the online Application Form form Directorate of Medical Education Assam official website at www.dmeassam.gov.in within time. (i) 2 Copies of recent passport size color photograph duly self-attested. (vi) Employment Exchange Registration Certificate. * Starting Date for Online Applications: 19-01-2018. * Last Date for Submitting Online Application: 02-02-2018 (Until Midnight). Note: There will be a single application fee for all the posts he/she want to apply. 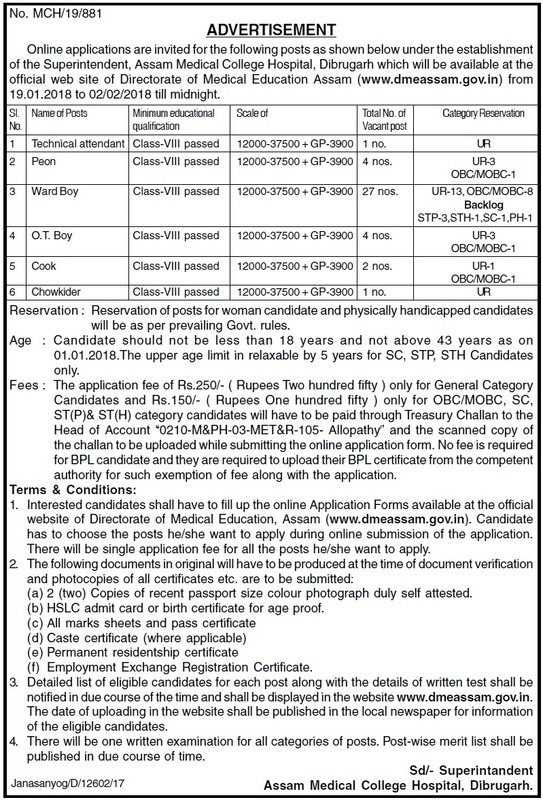 Detailed list of eligible candidates for each post along with the details of written test shall be notified in due course of the time and shall be displayed on the website www.dmeassam.gov.in. The date of uploading in the website shall be published in the local newspaper for information of the eligible candidates. There will be one written examination for all categories of posts. Post-wise merit list shall be published in due course of time. AMCH Dibrugarh Recruitment 2018 details. 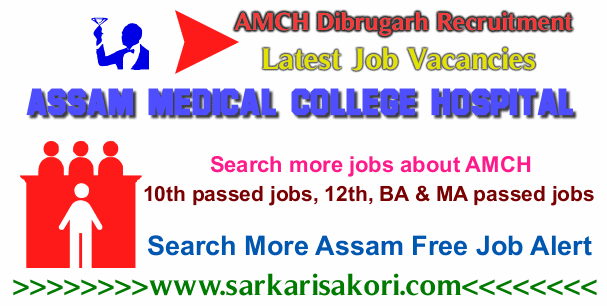 You will be interested more jobs at Assam Medical College Hospital Recruitment 2018, Assam Medical College Recruitment 2018 or AMCH Dibrugarh Recruitment.